Daniel Harnsberger is the Progressive Liberal, a professional wrestler who is both metaphor and caricature in these polarizing, reality-TV-inspired times — a self-righteous pundit who ridicules Republicans and conservatives along the back roads of America. 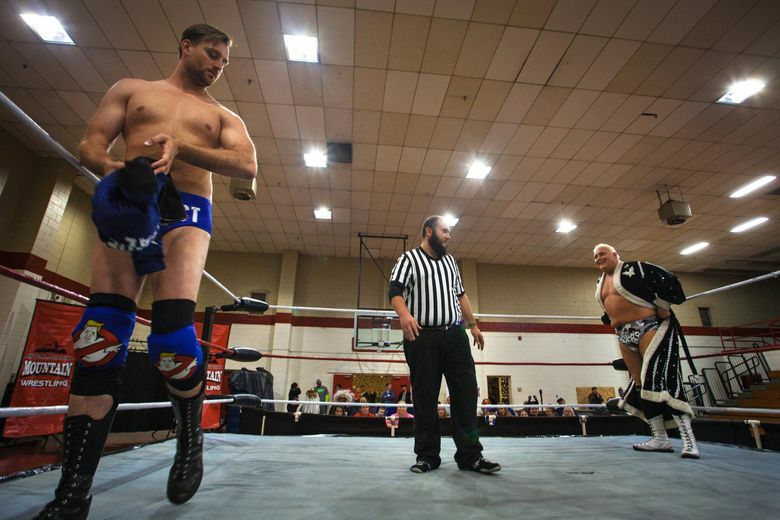 HAZARD, Ky. — The music stopped and Daniel Harnsberger — all 6-foot-5, 237 pounds of him — burst through the black curtain and jumped into the ring. Kids booed. Mothers shouted “snowflake.” A girl shot him thumbs down, and a logger threatened to take a swipe at him. Taunting his hecklers as hillbillies and saying coal was a “dirty lie,” Harnsberger — eyeing his nemesis and local favorite Pretty Boy Stan Lee — ranted and prowled, the perfect villain on a rainy night in an abandoned school in one of the poorest regions of the nation. “We don’t like you,” yelled a boy. Harnsberger is the Progressive Liberal, a professional wrestler whose renewable energy politics and preening arrogance have riled supporters of President Donald Trump across the Appalachian Mountains. He praises Hillary Clinton and invokes the Affordable Care Act. Worst of all he’s an outsider, a real estate agent from Richmond, Va., who drives south on weekends and slips on “blue wave” tights and a conceit that he’s better than out-of-work coal miners and Baptists with rifle racks in their pickups. Harnsberger is both metaphor and caricature in these polarizing, reality-TV-inspired times. In the era of Trump, when entertainment, politics and alternative facts whipsaw through the culture wars, the Progressive Liberal appears as a self-righteous pundit who ridicules Republicans and conservatives on the back roads of America. He travels a well-tread wrestling circuit — in these foothills a cineplex can be many miles away — and preys on stereotypes, scratching at insecurities and what he calls the “persecution complex” of the South. These mountains, which Kentucky writer Chris Offutt described as “humped like a kicked rug”, are unapologetic Trump territory. The region’s sensibilities hew closer to NASCAR and Hank Williams III than Lady Gaga and “The Crown.” And loyalty is prized: Republican Rep. Hal Rogers has represented this district for 37 years. That is not likely to change as the beleaguered president leads his party into next week’s midterm elections. Trump won 62.5 percent of the vote in Kentucky in 2016, but in the eastern part of the state that figure surpassed 70 percent in many counties, including Perry, where Hazard is the county seat. People here believe the president, who has a long history with professional wrestling and once clotheslined WWE promoter Vince McMahon at a scripted bout, will resurrect coal jobs, stop immigration, scrap environmental regulations, bring foreign capitals to heel and reinvent Washington with his tweets and anti-establishment fervor. Appalachia is a cruel and enchanting land of snapping winds and tin chimneys. Streams run like threads; morning mist scrims the hollows. Eyes peek from behind curtains and home-for-sale signs linger on lawns for years. The unions are broken and gone, and the coal trains that once shook the dawn no longer run to the steel mills of Pittsburgh and Bethlehem, Pa. Coal has succumbed to decades of globalization, mechanization and other factors that have turned men to fits and women to prayer. For generations everyone feared what they hoped wouldn’t come — that the land would fail to sustain the people whose Scotch-Irish ancestors are buried on its hillsides and in the shadows of its steeples. The hard-pressed swallow their shame and shop at secondhand stores. Addicts wander the North Fork of the Kentucky River; the police station keeps a drop-off box for “unwanted” prescription pills. In a swath of America that boasts self-reliance, about 30 percent of people live in poverty and more than 40 percent of children rely on Medicaid, a program Republicans want to shrink. Up the road, behind the courthouse where a sign reads that Elijah Combs settled this frontier with his seven brothers in 1790, Philip Stidham wandered amid guitars and a drum set at Taulbee Music, where he rings up customers on a 1920s cash register. He said Trump reaches into the working man’s heart, which has long been forsaken by Washington. That last word hit the air slow and soft, as if a man retracing footsteps. Stidham said he’s learned Appalachia’s uncompromising math: You take away one coal mining job (Kentucky has shed 10,000 since 2010), you wipe out 10 other people. A few hours before his match, part of the “Boneyard Beatdown” for the Appalachian Mountain Wrestling association, Harnsberger ate chicken and mashed potatoes in the bleachers. Big and guileless, with a swoop of brown hair hanging over his forehead, he’s the son of a carpenter mother, who came out as gay when he was a teenager, and a salesman father. He had been wrestling for years under different names — Dynamite Dan Richards, Big Dan — when in 2015 he created the Progressive Liberal. His trash talk is part smug progressive and political-science professor, as if Bill Maher slips on lace-up boots and body slams his way through the hinterlands. Once he enters the ring, Harnsberger is an incessant instigator, a master of condescension. Across the river, in Shawn Lewis’ tattoo parlor, a stuffed coyote sat on a cabinet and a scythe hung on the wall. Lewis’ skin served as canvas and diary, etched with colors, designs and names accumulated over the years, through the booms and busts of coal (his uncles and cousins worked the mines) into the hard place of now. He had a .45 caliber holstered on his hip — he proudly states he’s never been robbed — and a circle of stars tattooed on his face to connote his allegiance to the 3 Percenters militia group. When asked why support for Trump was high when the president wanted to curtail government programs the region relied on, Lewis did not see a contradiction. He said Trump promised to bring back coal. A local mine recently hired more than 30 people, an indication to many here that Trump was making good, even though they conceded it was a glimmer. The president’s relaxing of environmental regulations has had little effect on an industry in decline. Night fell. Cars drove down from the hollows to the Combs school gym. The concession was selling Halloween candy. Ringside seats went for $13, bleachers for $10. A girl swept by in a princess dress. A few men stepped outside for a last smoke in the rain. The national anthem crackled through a speaker and faded. Children ran toward the black curtain. Whoosh. The Progressive Liberal arrived with #Resist on his tights and white stars glowing on the sleeves of a blue jacket. “I am not a snowflake,” he shouted. “Loser, loser,” the crowd yelled. Body slams, arm twists, grunts and punches. The Progressive Liberal yelled “Hillary” when he got into a fix. The crowd shouted back: “Moron.” They have never forgotten how she called them “deplorables” and promised to put coal mines out of business. Pretty Boy won in two out of three falls, and the Progressive Liberal, a villain defeated in Trump country, walked to a locker room built for little kids. He wiped the sweat away and changed. Rain was falling and the night cold as he got into his car and drove over the mountains, past dying towns and abandoned coal mines on his way home to Virginia.